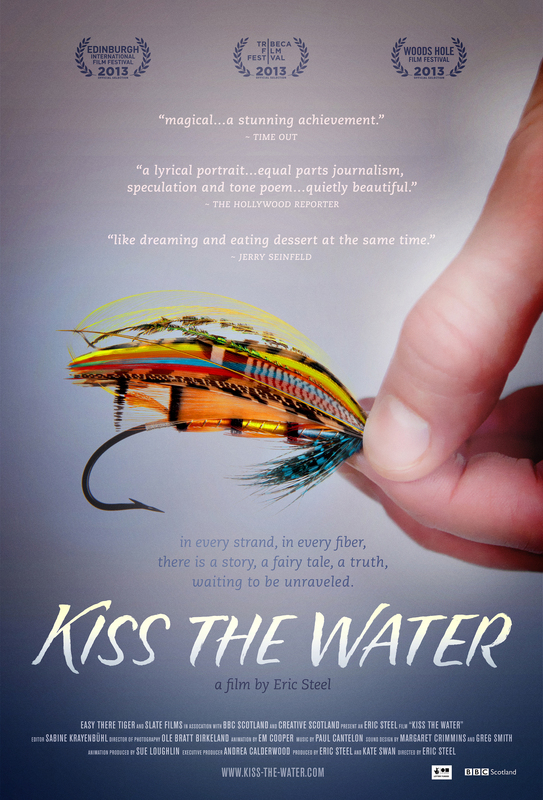 Kiss the Water mingles fact and fiction and weaves together interview footage, landscapes, the craft of fly tying and hand painted animation to create a poetic insight into the life of Megan Boyd. Attempting to understand the woman he never met, Steel imagines a haunting backstory of fantasy and desire for his isolated subject… This enigmatic and mysterious film from the director of the acclaimed documentary The Bridge is not one to miss. All the great documentary makers – from Werner Herzog to Michael Moore – have the ability to take a niche subject and make it universal. It’s a quicksilver skill that American filmmaker Eric Steel brings to ‘Kiss The Water’, telling the story of legendary salmon fly maker Megan Boyd. Few lives really move in such neat, tidy and predictable patterns anyway, and in order to appreciate this form of Nonfiction cinema we must accept that the truth is something not wholly tangible. Rather than leaving no stone unturned, Kiss the Water, prefers to let your attention flow over them, marvelling at what may lie beneath… Opportunities to become enchanted in our own lives are precious few, as the many admirers of Megan’s work must have known, and for a documentary about a seemingly simple subject to achieve such a thing is a delight. Steel’s return to nonfiction is a lyrical affair, composed of shimmering water, rolling Highlands and swaddling tranquillity. Em Cooper’s swirling, painterly animated inserts are icing on an already pretty cake. Kiss the Water dances around the mystical ripples of salmon fishing like a perfectly cast line skimming gently across the surface of a river. Make sure this strange little film isn’t one you let get away. Superbly made and beautifully illustrated, Kiss the Water is an utterly charming and captivating documentary that is well worth seeking out. Highly recommended. Quietly spellbinding… A wee treasure. It’s this new film’s genius that its “loneliness of the artist” theme extends from the main human subject – Scottish spinster Megan Boyd, who lived in a solitary rural cottage crafting “flies” so beautiful they looked like mini-rainbows and caught not just salmon but also the eye and purse of Prince Charles – to the anglers themselves, reminiscing to camera on their solipsistic art. An intriguing documentary about a real eccentric – Megan Boyd who crafted fishing flies with a passion … Cine-miniaturism with charm. An intriguing portrait of a woman devoted to her craft, yet one who couldn’t bear to catch and kill a fish herself… [a] gentle, artful pleasure. An odd kind of magic in every frame. Eric Steel (who made the powerful suicide study ‘The Bridge’) turns unlikely subject matter into a captivating journey through a landscape of mystery and imagination… Definitely not your standard doc, this is something special. Haunting and meditative, its intriguing collage of images and ideas offers evocative encouragement to enter another life, another time, another place. “There’s no one as foolish as a fisherman,” declares one of Kiss the Water’s (2013) contributors, though it could be said that any individual attempting to create an intriguing documentary based on the life of deceased salmon fly fabricator Megan Boyd is as equally imprudent. However, Eric Steel’s elegantly sketched film, in UK cinemas this week, is almost as faint and intricate as the flies we witness being meticulously constructed throughout the film. Steel’s finished film is a piece of art, in itself. Eric Steel, director of “The Bridge,” lends his idiosyncratic doc voice to the story of a fly-fishing legend. Fly fishing has inspired two of my favorite films that are not just entertaining but truly works of magical storytelling, A River Runs Through It and Rivers of the Lost Coast. Eric Steel is not your average documentary filmmaker, and this film is truly in the same league as my other fishing favorites.